If the taste of coffee awakens passions and endless conversations, even more can the story of its journey through the world. Worthy biography of a globetrotting adventurer, as magical as an epic story. knowing its odyssey, is the duty of any reader and dreamer. 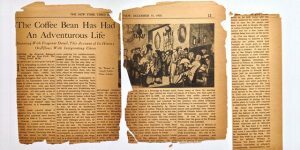 In this quest to discover the history of the golden grain, we find a historical piece, a beautiful narrative published in the New York Times in the distant 1935, where Heinrich Edward Jacob tells, in a masterly way, the history of coffee and its influence on the world. We know you will enjoy reading and it will captivate you as much as it did to us. It is interesting to know the exciting story intertwined in the deeds and doings of coffee, normally seen as such a common product. The wars, the naval battles and the commercial struggles that were fought in its name; its passage from pharmacies to coffee shops and its bitter rivalry with beer, wines and strong liquors; the number of millionaires who has enriched and ruined for its cause. All these signs of adventure reflect the epic history of coffee, more like a story of “One Thousand and One Nights” than a routine drink. With a variety of colorful details, this countdown of coffee history explains how the grain, whose qualities were known around 1000 AD, traveled in a strange chain of events from Ethiopia to Arabia and then to Europe. One of these events happened in 1683, when the Turks were surrounding Vienna. 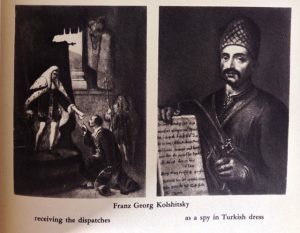 Knowing that the city was about to fall, Georg Franz Kolschitzky and his partner, who spoke Turkish perfectly, offered to take a letter to the Duke of Lorraine (France) begging reinforcements. Disguised as Turks, they boldly passed between the enemy lines in the middle of the rain. On their way they met a Turkish commander, who, moved by his situation and seeing them soaked, invited them to his tent where he helped them cool off and gave them a cup of hot coffee. The brave messengers finally managed to reach and guide their allies who were going to attack the Turks. When the battle was over, Kolschitzky saw a group of Viennese looting soldiers gathered around large bundles full of brown beans abandoned by the Turks who had managed to escape. Some thought it was camel food and tried to burn it, but as soon as Kolschitzky smelled it, he remembered the wonderful drink the old commander had given them. Immediately he urged for all the bags and gladly they were granted, because nobody found them any use. Kolschitzky transported them to Vienna and he was granted the municipality as gratitude for lifting the blockade. In a short period of time, Kolschitzky opened the first coffee shop in Vienna. In a lively narrative, full of picturesque incidents, Mr. Jacob (author) follows the expansion of coffee to Germany, where it became the favorite drink of women, but could not compete against beer and wine in men. It did not arrive in France until the year 1634, when a certain gentleman from La Roque returned from Constantinople to Marseille, bringing with him a small pot of metal and grains that he had toasted and prepared in it. In principle it was considered a medicine and sold in pharmacies. The doctors prescribed it for scurvy, smallpox, tuberculosis, dropsy and ophthalmia, but they were careful and warned their patients not to mix the drink with milk, because it was considered that this could produce leprosy. 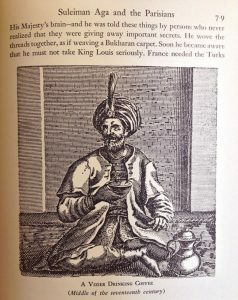 Coffee did not take its place as a drink in France until Commander Suleiman visited the Court of Louis XIV in the year 1669. As Ambassador of the Grand Turk, he entered extravagantly, obtained information from women of the court who accepted his hospitality with a few doses of coffee. In this way, he discovered how to consolidate his alliance against Germany. His visit generated a furor of coffee consumption that Molière called “Turcomania”. Coffee was very expensive in those days and for this reason it was considered a rich drink until 1672, when Pascal opened his first coffee shop in Paris. A more interesting chapter talks about the alliance between coffee, literature and politics. Around the year 1720, there were 380 coffee shops in Paris, many of them became meeting places for writers who had begun to think that coffee had the power to clarify and energize their brains, sharpen the memory and add fluidity and brilliance to their conversations. Other classes also frequented these places and gradually became spaces for political forums, where the literati preached new ideas. It was in these places, as Jacob reflects, that the seed of the French Revolution germinated. Mexican jumping bean is perfectly passive compared to the coffee bean and its multiple wanderings. The cost of importing from Abyssinia and Arabia was so high that any other way to get it must inevitably be found. The Dutch were the first to solve the problem. Their East India company traded in the Malay Archipelago for cloves and black pepper until Willem Von Outborn, at the end of the seventeenth century, planted coffee in Java and Sumatra. The bush grew successfully in its new home and the Dutch enslaved the native population to care for the plants. Soon, the Dutch could dictate the price of coffee throughout Europe. This situation of Dutch monopoly lasted only for a few years, because the tireless coffee bean was always in motion. In 1714, the mayor of Amsterdam, with the intention of achieving some publicity for the coffee that had brought so much gold to Holland, sent Louis XIV a coffee plant as a gift. The plant was located in one of the King’s greenhouses and remained there as a simple curiosity. However, an infantry captain, Gabriel Mathieu Desclieux (also known as De Clieu), returned to France on leave from his duties in Martinique and was obsessed with the idea that coffee could be sown in French Martinique as successfully as in France, the Dutch Java. Desclieux managed to obtain a tiny green sprout from the Royal plant. And, after keeping it very carefully during the long journey, he managed to take it to Martinique in 1723. There, it flourished and spread to other Leeward Islands and to Brazil. In this way, the polite gesture of the Dutch mayor to give the small plant to Louis XIV, became the destruction of the Dutch monopoly. Jacob has integrated the story of this heroic brown grain with the history of the world and has brilliantly summarized entire periods to explain the success or failure of this product in different countries and at different times. He has done this task in such a nice and charming way that even people who do not drink coffee will be fascinated and captivated by the book. 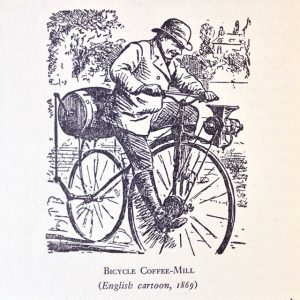 For those who want to delve into the subject, the book “All about coffee” by William H. Ukers, is still insurmountable since it is very complete in terms of academics, documentation and illustration.